Same location as last year - Russian River Ferry Crossing on the Kenai River. We'll update with more info as it becomes available! The January Meeting will be held at the BP Energy Center starting at 6:30pm and is open to the public. Our topic for the evening will be a presentation by AJ Hoffman from 3 Rivers Fly and Tackle Shop in Wasilla. He will be shoing pictures and discussing some very f=good trips he took in 2018. As part of our organizational agreement with Fly Fishers International, AFF can obtain some merchandise based on the number of new members for FFI from our Club each year. This year we were able to get a TFO 8wt 4 piece rod. 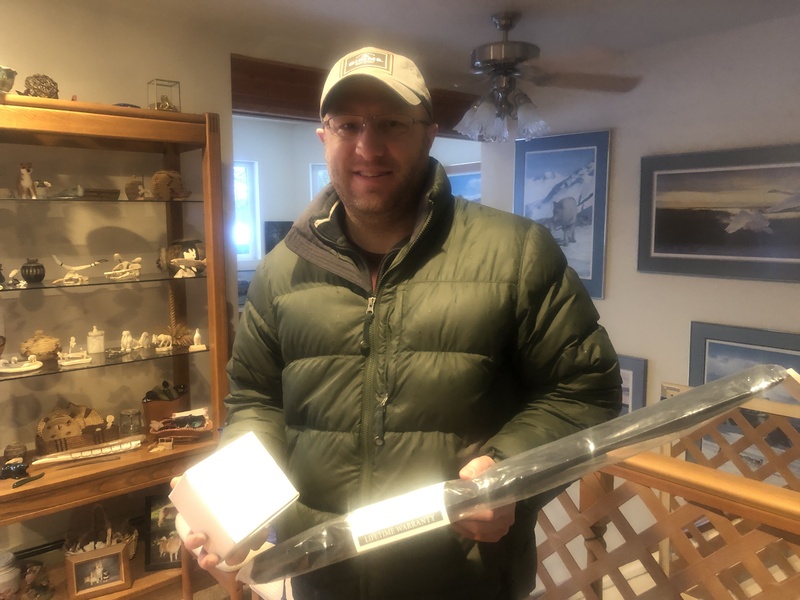 We added a TFO 7-8 Large Arbor Fly Reel to the rod and held a drawing at the November 2018 meeting. To be entered in the drawing, you had to be a new FFI member in either 2017 or 2018. The winner was Shayne Pond of Sterling and he was completely surprised! When Rich called him to let him know his first reaction was "Winner? Of WHAT?" He picked the items up this weekend and was pretty excited! Congratulations, Shayne! Thank you for being a member of FFI. Annual Gift Exchange is the highlight of the evening. The rules are simple: Bring a gift! – get a gift! The gift should be in the $20 to $25 price range, wrapped, and hopefully fly fishing related. Check in with Rich when you get there and exchange your gift for a ticket. When it’s time, we’ll start drawing tickets. As your ticket is drawn, you get to choose a gift from the pile. Once we’re out of tickets, the extra gifts packages will go into the Ghillie Raffle. What extra gifts you ask? Shouldn’t this be a break-even exchange? December is also the month that we feature some short programs from our own members. Keven Kleweno and Rich Johnson are on tap to share some of their fishing experiences. Keven will be talking about fishing with Family & Friends, Rich will be sharing his experience and opinions on the Kvichak River and Seasons on the Fly Lodge. Coming very soon will be the 2018 AFF Fundraising Auction. It will be done ONLINE ONLY and will feature all those great trips we have seen in the past. We will update very soon but the starting point will be HERE. Start planning those fishing trips for 2019 right here and be ready when the fun begins! 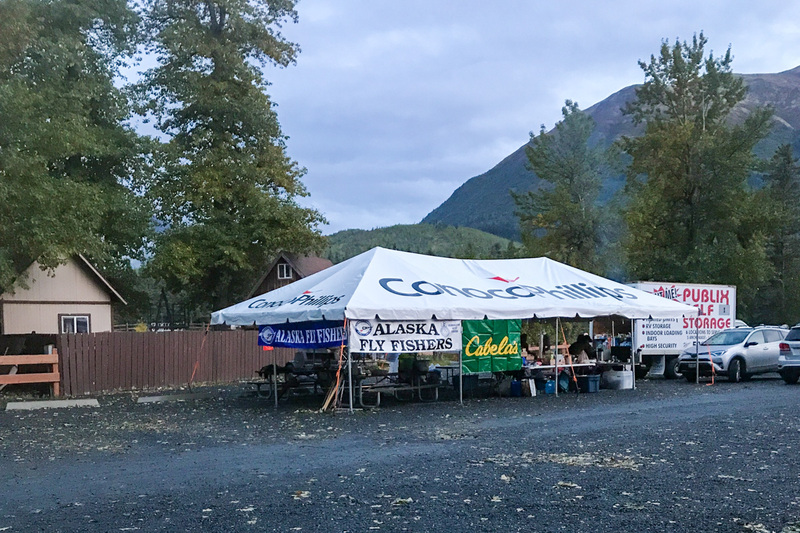 Please join us as we get together with the local Trout Unlimited Chapter at Beach Lake in Chugiak on Saturday the 27th for Hunt, Fish, Eat, and Vote. For more information check out the notice on our Home Page or go to the highlighted link. Our General Membership meeting on October 1st will be held at the normal time - 6:30 PM - at the BP Energy Center. Our Guest Speaker will be Tom Logan, Chairman of the Board of Fly Fishers International and owner of North Florida Fly Fishing Adventures. The first part of the meeting will be about FFI. We are an affiliate club and encourage all our membership to join their organization as well. This meeting will explain why you should seriously consider it. Then Tom is going to give a presentation about the Tallahassee, Florida are where he lives and the fly fishing opportunities there. A nice change of pace for us since we have no warm water fisheries here. And if you have Photos for the Photo Contest, you can bring them to the meeting. Last day to submit is October 9th! Entry Information and submission form are HERE. Tom Logan, Chairman of the Board of Fly Fishers International and owner of North Florida Fly Fishing Adventures is in town to do a presentation for our Monday, October 1st Meeting and has graciously agreed to host a Fly Tying Clinic incorporating some patterns and techniques we don't normally see for fishing here. You can find more information about the clinic on our Calendar and at this page - Special Clinic with Tom Logan. This is a Members Only Event and is limited to 15 tiers. (If you want to come pay to watch, that's allowed and does't count toward the 15.) Contact Rich at Rich@2GuysFlyFishing.net if you want to tie. It's time again for our annual Kenai River Cleanup! Set-up is on Friday September 7th, the event is the 8th, and fishing on the 9th! Come on down and help us with this important project. Each year we and several other organizations get together to help restore the rivers and roads around Cooper Landing back to a clean condition. We pick up trash, discarded fishing tackle, and monofilament to make the streams safe for wildlife and pleasant to spend time on for us humans. On Saturday we will have hot drinks, food, and trash bags available for everyone to use. In the evening there will be a bonfire, a hot meal, and entertainment! Yes! The Photo Contest is back! Rules are similar to previous years with 4 individual categories and a maximum of 3 submissions per category. Photos must have been taken in 2017 or 2018 and should fit into one of the 4 categories. Rules and the entry form are available here on the website on the Photo Contest page. Entries must be submitted by October 9th, and prizes and voting for the People's Choice award will take place at our November Business meeting. So head on over to the Photo Contest page and start getting those pics ready to print!